Aging, Irrelevant, Out of Work, Drunk, Incontinent and Possibly Senile Old Man Says “F” Word at Tony Award Ceremonies! 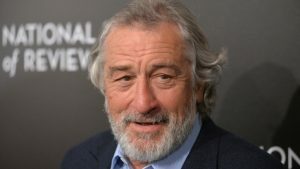 Robert De Niro, who hasn’t had an acting job or been nominated for an award in years stood on stage at the Tony Award Ceremony and bravely uttered “F*ck Trump” to a rousing standing ovation by the elite in attendance. The producers of the Tony Awards were at first confused and considered cutting his mic. “He wasn’t scheduled to talk at all” said one. In fact the only reason we let him back stage was out of compassion. He seemed confused. He was wandering around muttering “I used to be important.” Whenever a young chorus girl would walk past him he’d put his hands down his pants and start pleasuring himself. I don’t have to tell you that in today’s hypersensitive #metoo climate that sort of behavior is frowned upon. We didn’t want any lawsuits so we gave him a button to push to distract him. He spent the next half hour playing with the button and giggling. Then we noticed that a trail of urine was running down his pants. I said “Bobby! Did you pee your pants? What did we tell you? Bad Bobby! Bad Bobby!” He just shrugged and said “Me pee pee.” We had an intern clean him up and give him dry underwear and pants. I thought the crisis had passed. Unfortunately it had only begun. Temporarily losing sight of the befuddled senior citizen no one noticed as he walked out on stage. I saw him grab the mic and I thought “Oh Oh. This is trouble.” We were about to order the director to cut off his mic when De Niro started swearing. “F” this. “F” that. “F Trump.” Well once he started saying that we knew we had ratings gold! Swearing is edgy. Just ask any actor. So were were ‘Yeah, keep it up. That’s it!” And the fellow actors gave him a standing ovation. I tell you cursing is a sign of maturity and edginess. It’s a sign of resistance. I don’t have to tell you that the ratings for the Tonys are lower than Samantha Bee’s. All she had to do was call Trump’s daughter a “feckless c*nt” and he was renewed for two years. I’m hoping with all these “F” bombs to be renewed three years! I was wondering how we would top that when De Niro stuck his hand down his pants and started masturbating. “F” words and jacking off! I have never been so proud to be a producer! The senile former actor was then led off stage to massive cheers by the best and brightest of America. He was then given a chocolate bar while producers’ searched for his caregiver. Who is this person? Was it famous? I think he was in the ’70s. But now he just goes around mouthing jibberish. It’s really a failure of our healthcare system to provide for these incontinent seniors.